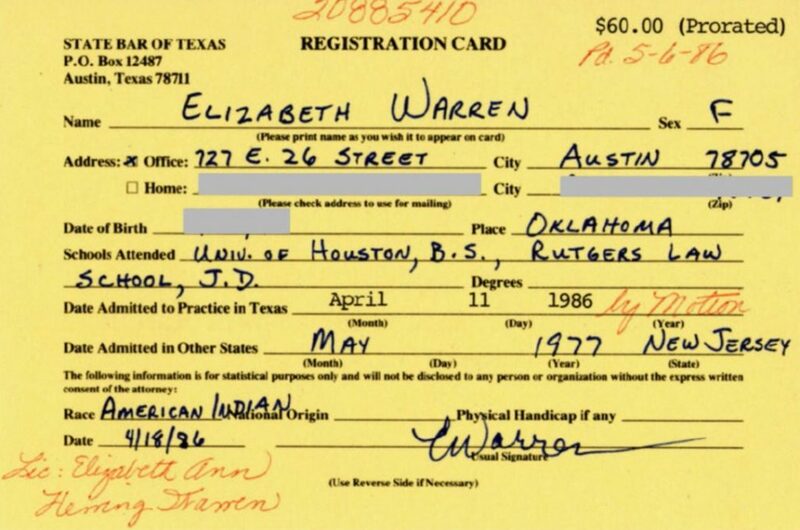 U.S. Democratic presidential contender Elizabeth Warren identified herself as an “American Indian” in hand-writing on her 1986 registration card for the State Bar of Texas, the Washington Post reported on Tuesday. The disclosure marks the latest twist in a controversy surrounding Warren and her claims to Native American ancestry as she raises money and hires staff ahead of an expected formal launch to her 2020 campaign for the Democratic presidential nomination. The yellow registration card, which is dated April 1986, was filled out in blue ink and signed by Warren, the Post reported. The Post reported that Warren apologized during an interview for identifying herself as a Native American. The paper said her office did not dispute the card’s authenticity. Reuters reporters have not inspected the card in person. Warren angered tribal leaders and some of her fellow Democrats when she announced she had taken a DNA test to put to rest criticism from Republicans, and especially President Donald Trump, of her ancestry claims. The results found Warren had at least one Native American ancestor many generations ago. However, Native American leaders criticized Warren for using a DNA test to lay claim to even a vague connection to a tribal nation, saying culture and sovereignty were just as important as blood and the tests did not confer the rights of tribal citizenship. Democrats feared Warren was playing into the hands of Trump and other Republicans by engaging them on the issue. The Cherokee Nation said last week Warren had apologized for taking the test and reaffirmed she was not a citizen of any tribal nation. Warren has created an exploratory committee to begin raising money and hiring staff for a run at the Democratic presidential nomination in 2020. She is expected to formally launch her campaign on Saturday.